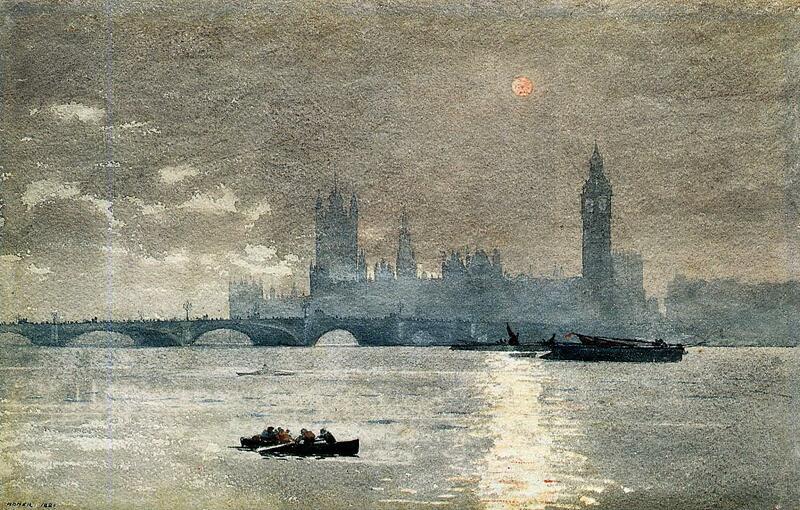 Winslow Homer, The Houses of Parliament (1881), watercolour on paper, 32.3 x 50.1 cm, Hirshhorn Museum and Sculpture Garden, Washington, DC. Wikimedia Commons. See if these examples convince you. Born in Boston, Massachusetts, in 1836, his mother was a skilled botanical painter in watercolours and his first teacher. He moved to the leafy suburbs of Cambridge at the age of six. He was apprenticed to a commercial lithographer in Boston for two years, but set up as a freelance illustrator in 1857. He supplied illustrations of life in Boston and the countryside around to Harper’s Weekly and other magazines, in a rapidly growing market. In 1859 he moved his studio to New York, where he took classes at the National Academy of Design and learned fine art painting too. He first read Chevreul’s colour theories in 1860. He was sent to the American Civil War from 1861-5, where he made three trips to the front, sketching military life and battle scenes. His painting Home, Sweet Home (1863) was exhibited at the National Academy and well received, and he spent a year in France in 1867. There he concentrated on landscapes and rural life, and illustrations for Harper’s Weekly showing life in Paris. He was influenced more by the Barbizon School, Breton, Corot, and Millet, than Manet or Courbet. On his return to the US he painted more rural and coastal scenes, and started to show signs in them of his brushwork loosening up. Winslow Homer, Beach Scene (c 1869), oil on canvas, 29.3 x 24 cm, Thyssen-Bornemisza Museum, Madrid. Wikimedia Commons. During the 1870s he stopped work as an illustrator, and concentrated more on watercolours, which became his preferred medium from 1873, when staying in Gloucester, MA, during that summer. At that time, Gloucester was the busiest seaport in the US. Some of these were studies which he then painted in oils, but increasingly he found greater expression in watercolour. 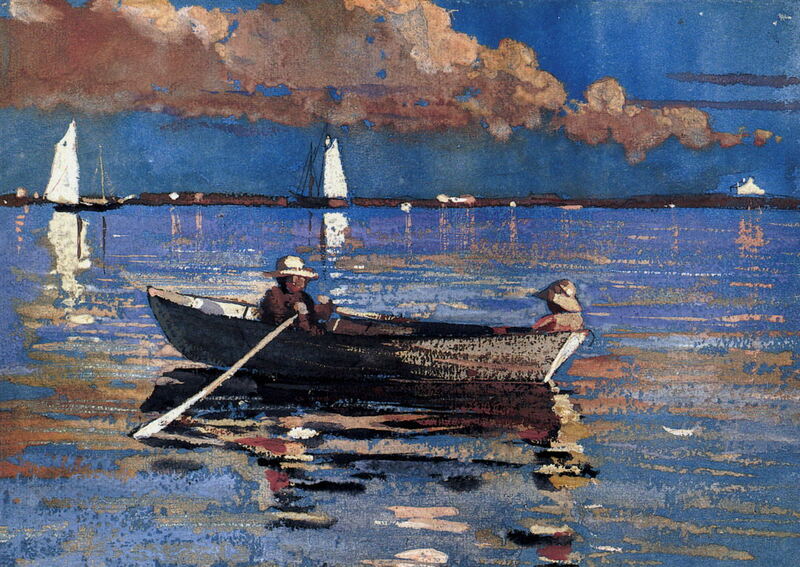 Winslow Homer, Gloucester Harbour (1873), watercolour and gouache on paper, 24.1 x 34.3 cm, Private collection. Wikimedia Commons. 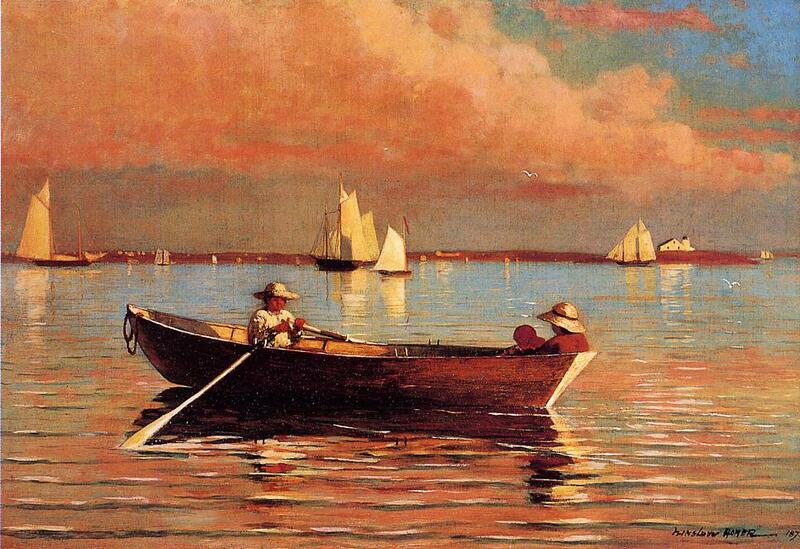 Winslow Homer, Gloucester Harbour (1873), oil on canvas, 39.37 x 56.83 cm, Nelson-Atkins Museum of Art, Kansas City, MO. Wikimedia Commons. Perhaps as a result of his visit to France, many of his paintings during the 1870s showed very loose brushwork, and greater emphasis on markmaking than previously. At first the critics were disparaging of his watercolours, but they were popular and sold well. 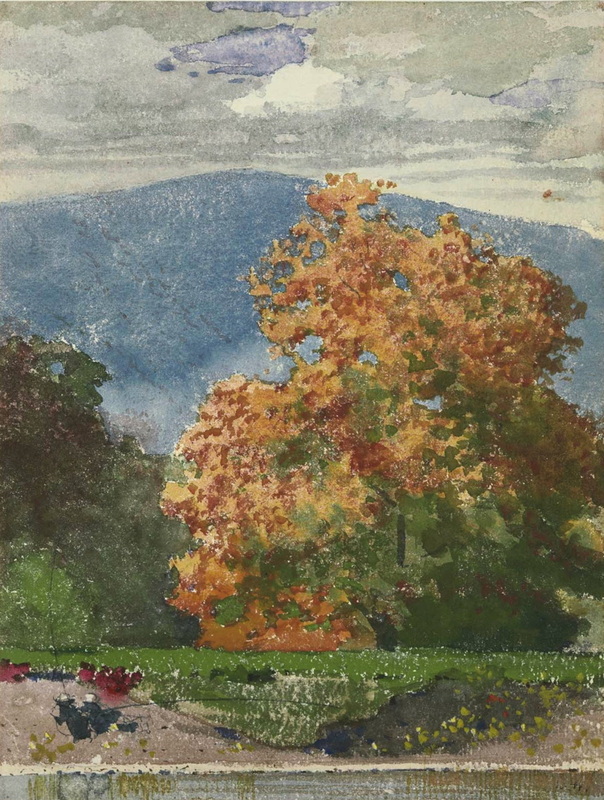 He also developed and frequently used a wide range of techniques to enhance his watercolours. These included the use of both transparent and opaque watercolour, thin layered washes, scraping, texture, resist, splattering, and even abrasive paper. 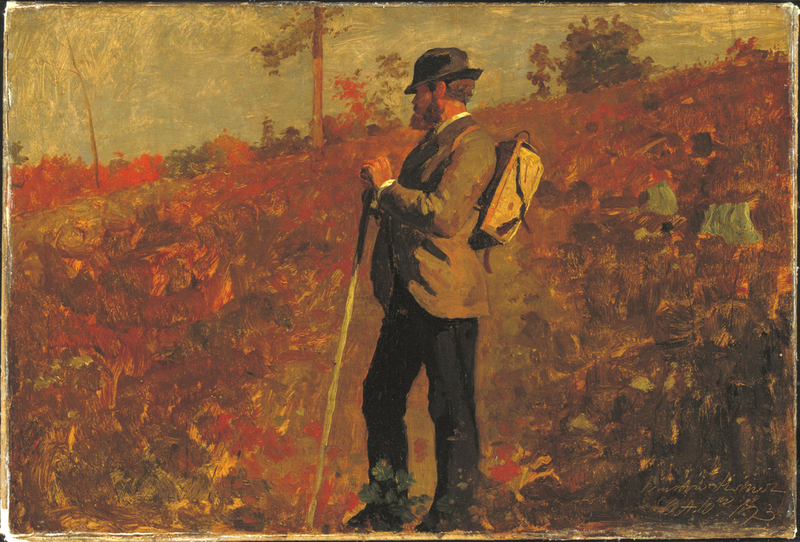 Winslow Homer, Man with a Knapsack (1873), oil on canvas, 57.2 x 74.9 cm, Cooper-Hewitt, Smithsonian Design Museum, New York, NY. Wikimedia Commons. 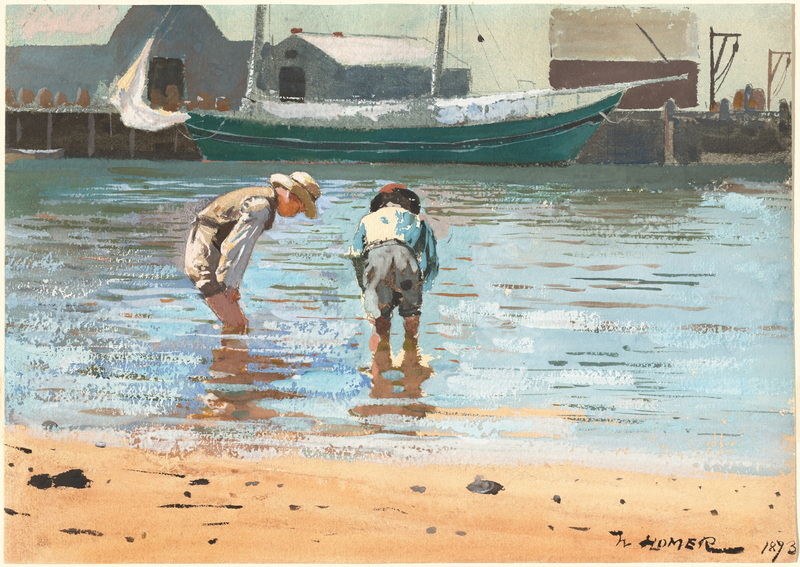 Winslow Homer, Boys Wading (1873), watercolour and gouache over graphite on wove paper, 24.77 x 34.93 cm, The National Gallery of Art, Washington, DC. Wikimedia Commons. 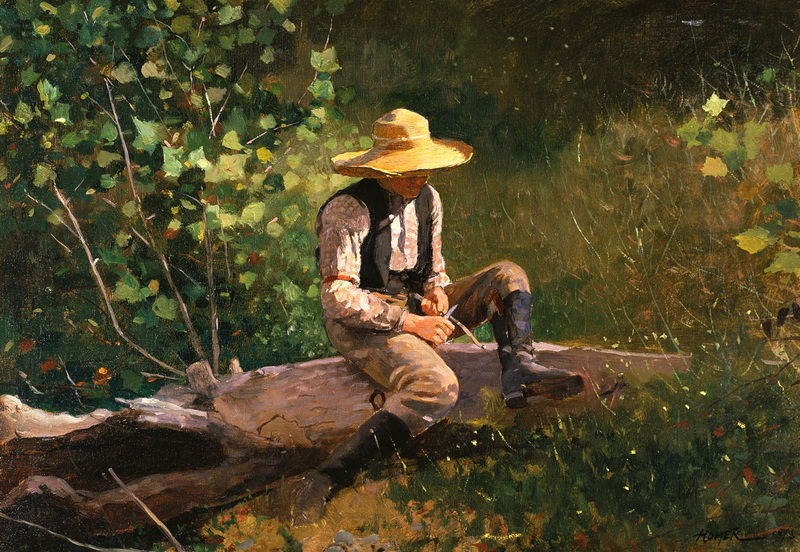 Winslow Homer, The Whittling Boy (1873), oil on canvas, 40 x 57.6 cm, The Terra Museum of American Art, Chicago, IL. Wikimedia Commons. 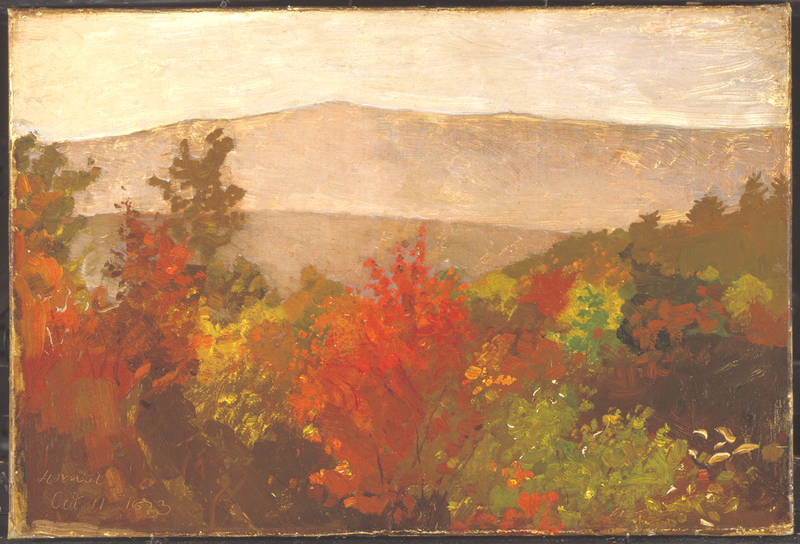 Winslow Homer, Autumn Tree Tops (1873), oil on canvas, 50.8 x 66 cm, Cooper-Hewitt, Smithsonian Design Museum, New York, NY. Wikimedia Commons. From 1877 he exhibited regularly at the Boston Art Club, where his watercolours achieved recognition. He also met other leading painters of the day, including William Merritt Chase. 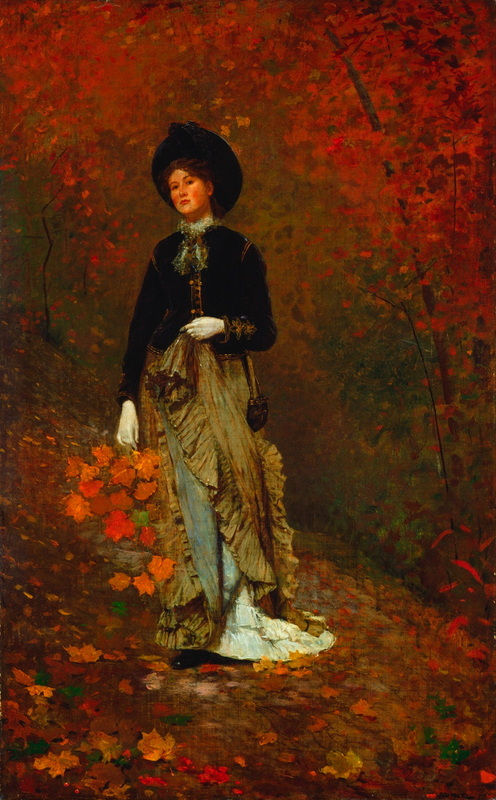 Winslow Homer, Autumn (1877), oil on canvas, 97.1 x 58.9 cm, The National Gallery of Art, Washington, DC. Wikimedia Commons. 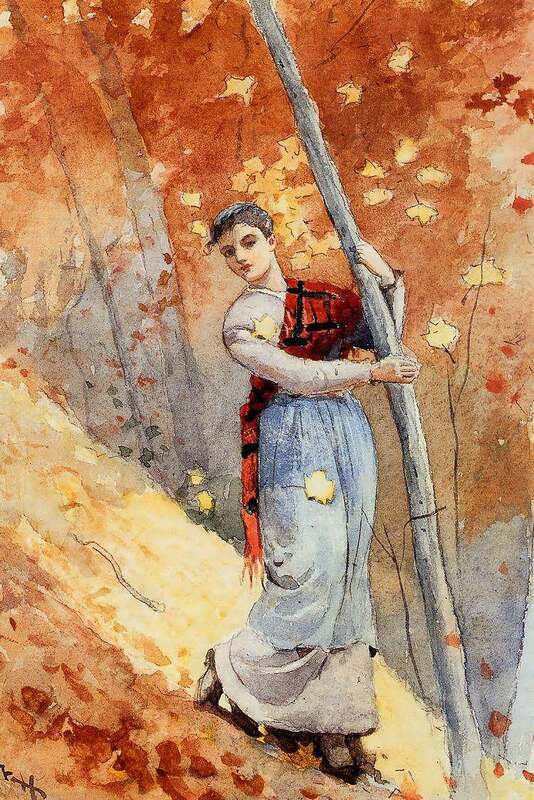 Winslow Homer, In Autumn Woods (c 1877), watercolour, 27.9 x 19 cm, Private collection. Wikimedia Commons. 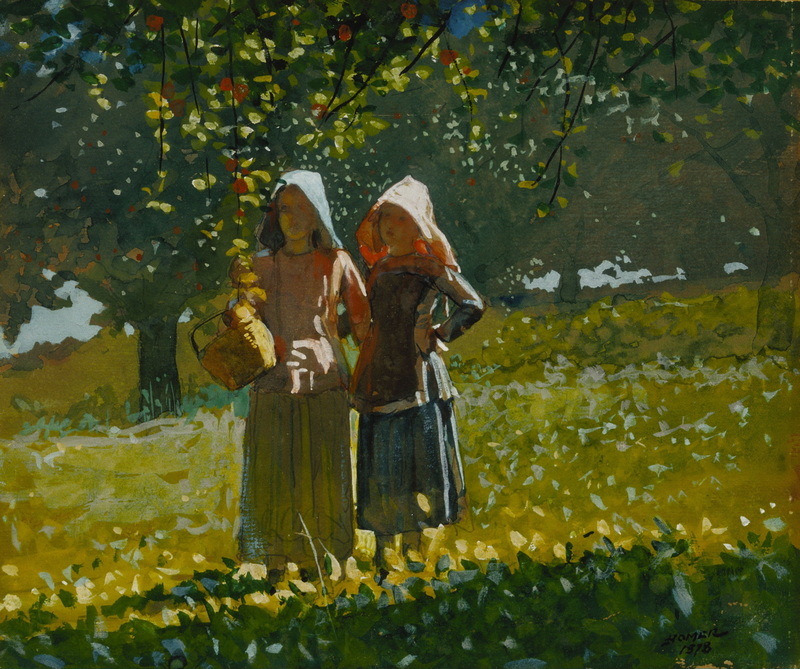 Winslow Homer, Apple Picking (1878), opaque watercolour over graphite on wove paper, 17.8 x 21.3 cm, The Art Institute of Chicago and Terra Museum of American Art, Chicago, IL. Wikimedia Commons. 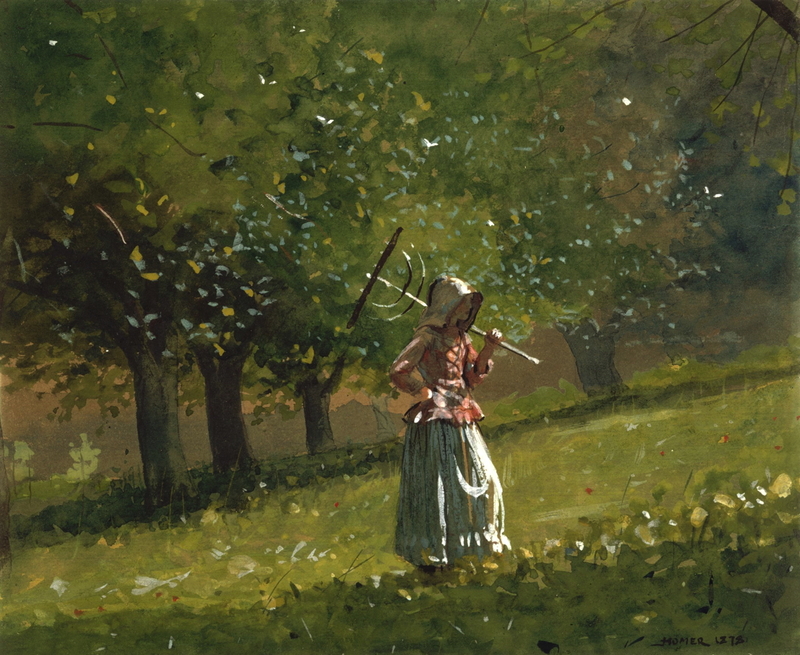 Winslow Homer, Girl with Hay Rake (1878), watercolour on wove paper, 17.6 x 21.4 cm, The National Gallery of Art, Washington, DC. Wikimedia Commons. 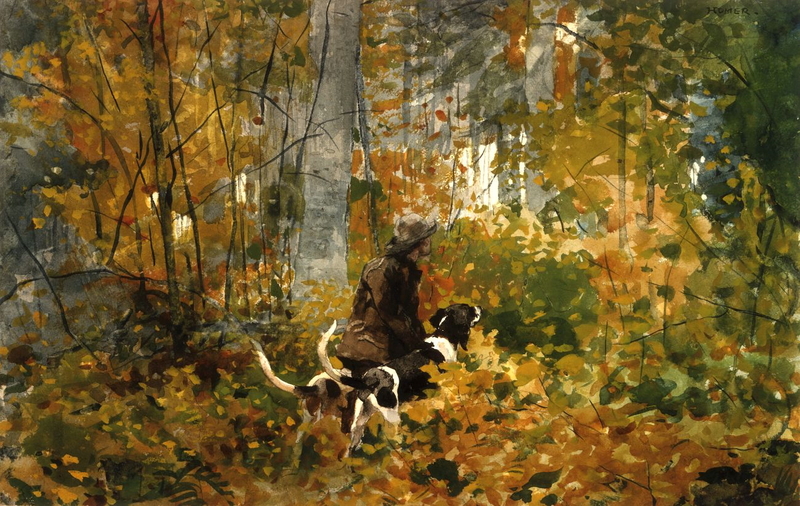 Winslow Homer, Autumn Foliage with Two Youths Fishing (c 1878), watercolour over pencil on paper, 28.6 x 21.6 cm, Museum of Fine Arts, Boston, MA. Wikimedia Commons. 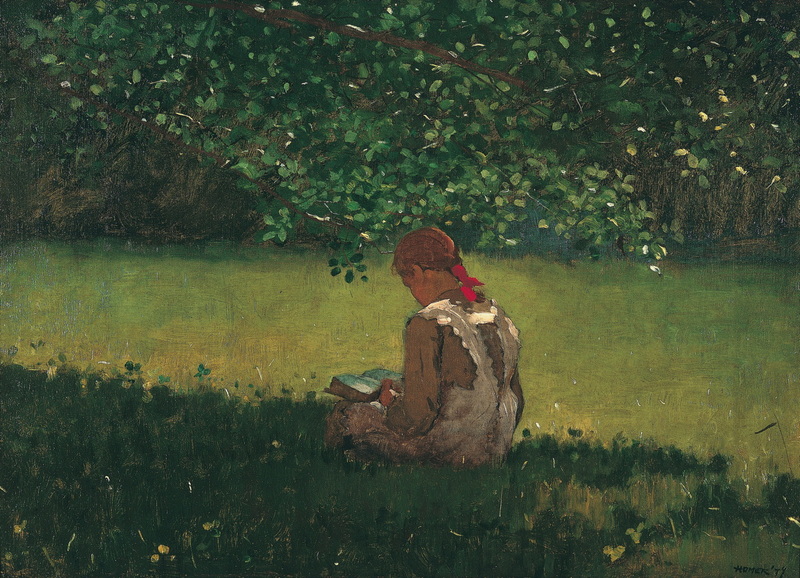 Winslow Homer, Reading by the Brook (1879), oil on canvas, 40.3 x 57.8 cm, Memphis Brooks Museum of Art, Memphis, TN. Memphis Brooks Museum of Art, via Wikimedia Commons. 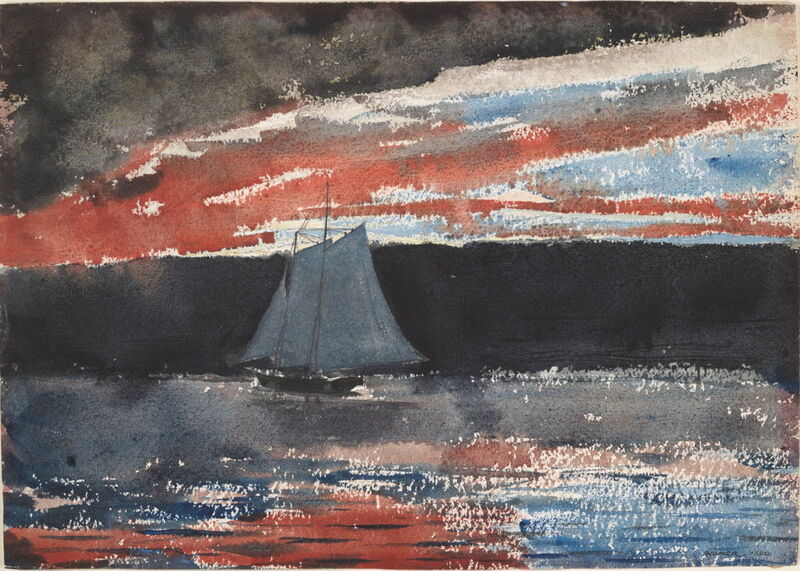 Winslow Homer, Schooner at Sunset (1880), watercolour and graphite on wove paper, 25 x 35 cm, Fogg Museum, Harvard, Cambridge, MA. Wikimedia Commons. In the late 1870s he became more reclusive, living in Gloucester, MA, and at one time in Eastern Point Lighthouse. He spent 1881-2 in the coastal village of Cullercoats, Tyne and Wear, in the north-east of England. There his subjects were the people in the local community and their lives in relationship with the sea, including the local industry of fishing. He painted them almost exclusively in watercolour. 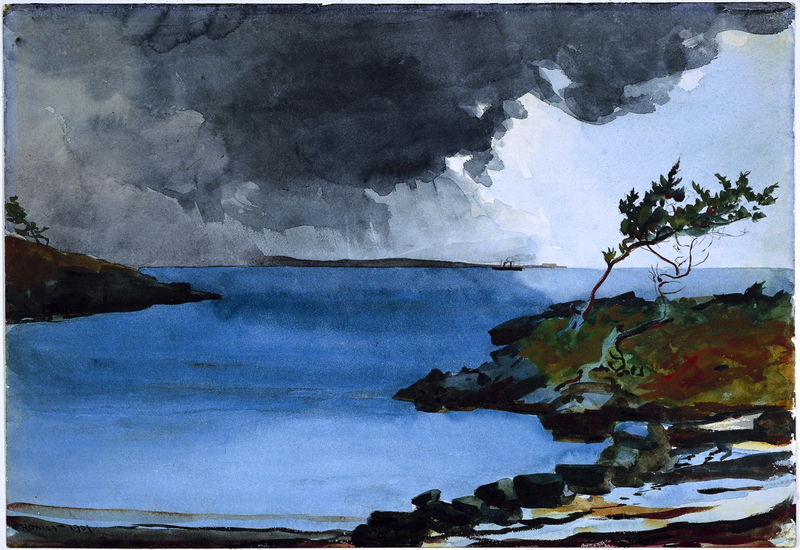 Winslow Homer, Watching the Tempest (1881), watercolour over graphite on wove paper, 35.6 x 50.4 cm, Fogg Museum, Harvard, Cambridge, MA. Wikimedia Commons. 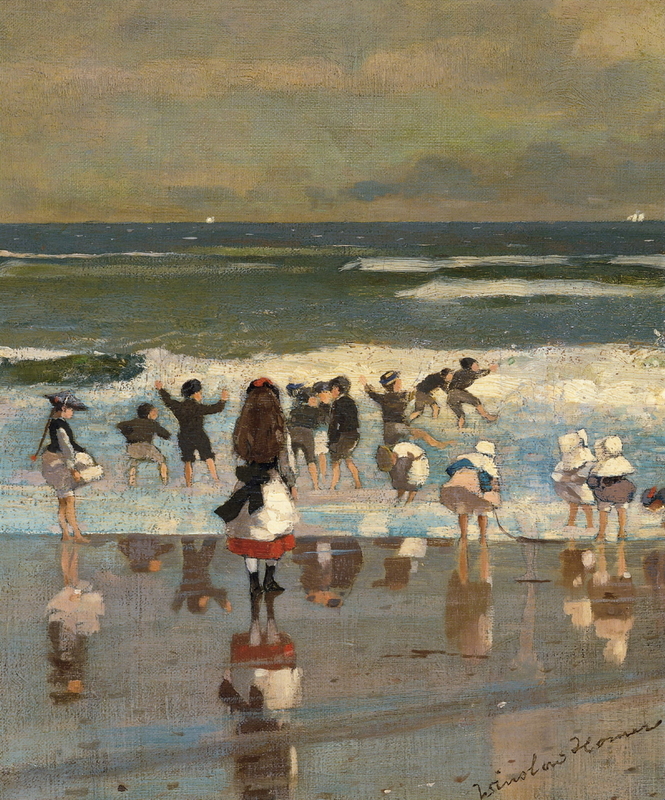 His watercolours from Cullercoats were well received on his return to the US at the end of 1882, with critics welcoming his change of style and vision. Winslow Homer, On the Trail (c 1882), watercolour, 32.1 x 50.5 cm, The National Gallery of Art, Washington, DC. Wikimedia Commons. 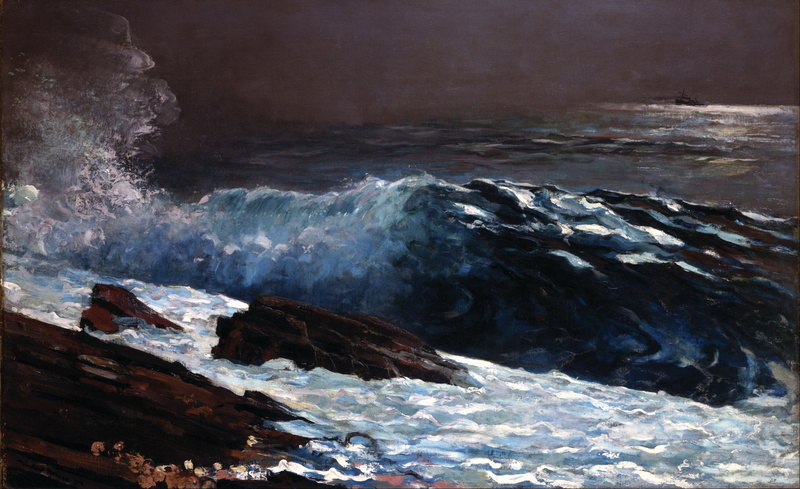 In 1883 he moved to Prouts Neck, Maine, just a stone’s throw from the Atlantic Ocean, where he painted many major works depicting the sea. Unfortunately these did not sell well, but his family supported him. He was able to spend the winters of 1884-5 in Florida, Cuba, and the Bahamas, where he continued his watercolour painting. 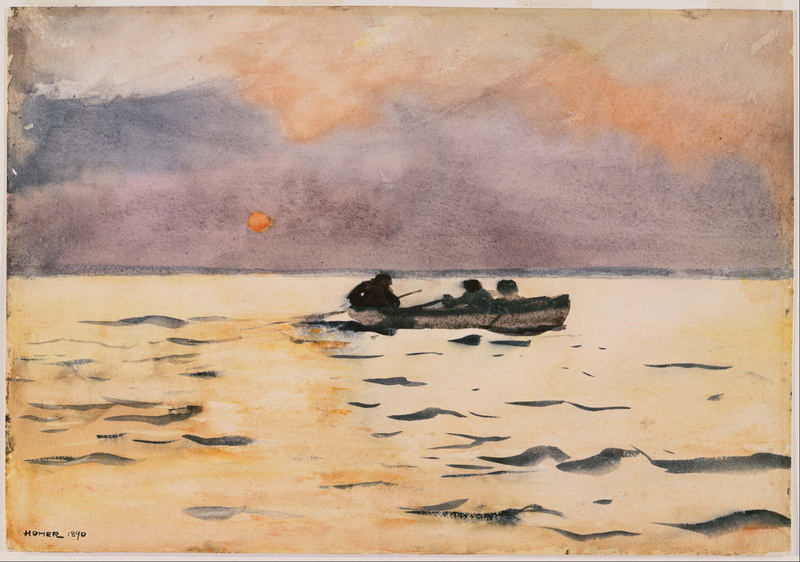 Winslow Homer, Rowing Home (1890), watercolour on paper, 13.75 x 19.88 cm, The Phillips Collection, Washington, DC. Wikimedia Commons. Winslow Homer, Sunlight on the Coast (1890), oil on canvas, 76.9 x 123.3 cm, Toledo Museum of Art, Toledo, OH. Wikimedia Commons. 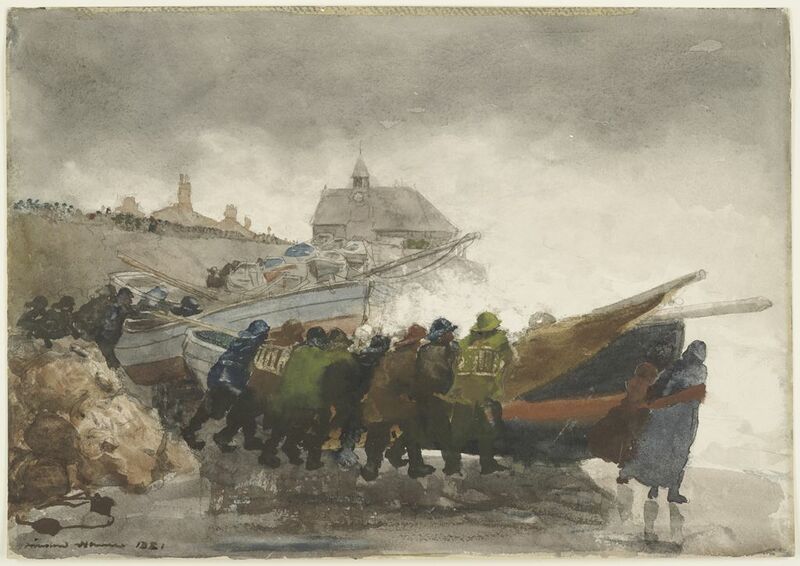 Winslow Homer, The Coming Storm (1901), watercolour over graphite on paper, 36.9 x 53.5 cm, The National Gallery of Art, Washington, DC. Wikimedia Commons. He eventually achieved better financial stability in 1900, enabling him to travel more, still painting largely in watercolour. Between 1873 and 1905, he had painted over 700 works in watercolour. He died in 1910. Winslow Homer never aspired to be an impressionist, but painted many works plein air, with loose brushwork, and conveying impressions. As such, from about 1873 until he went to Cullercoats in 1881, he had an impressionist style, and established himself as America’s foremost watercolour painter. National Gallery of Art virtual exhibition from 2005. Posted in Painting and tagged Barbizon, Breton, Chase, Chevreul, Corot, Cullercoats, Homer, Impressionism, Millet, painting, USA, watercolour. Bookmark the permalink.